Daniel’s part of the trip was next and boy oh boy, he did not disappoint! The Mekong Delta, located in Southern Vietnam is a vast maze of rivers, canals, swamps and islands which has been named a biological treasure trove as more than 1000 animal species were discovered living there. 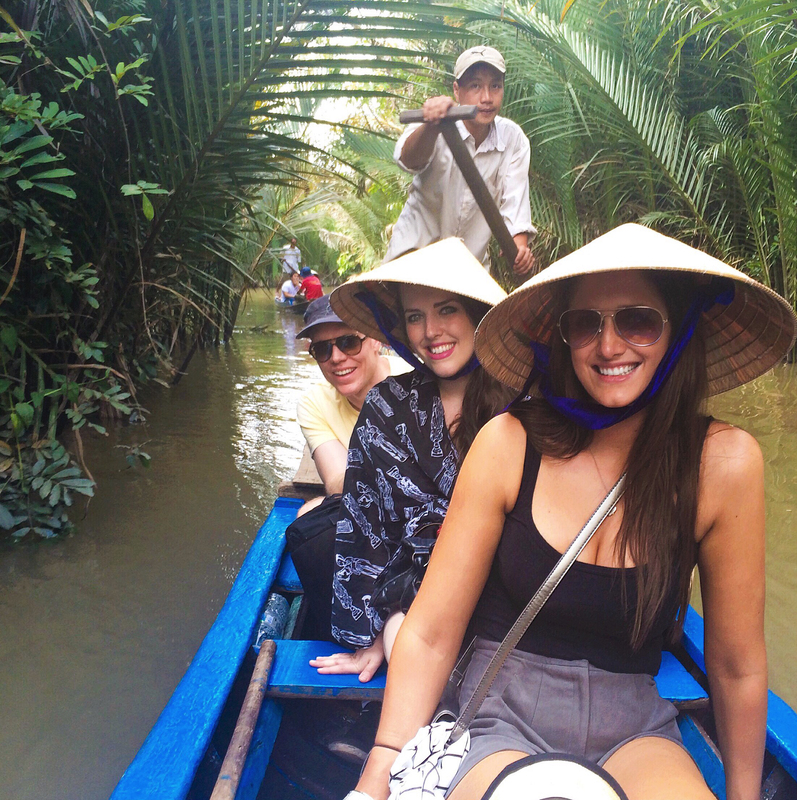 So as you can tell, a trip along the Mekong Delta is the perfect way to get a taste of the Vietnamese countryside. 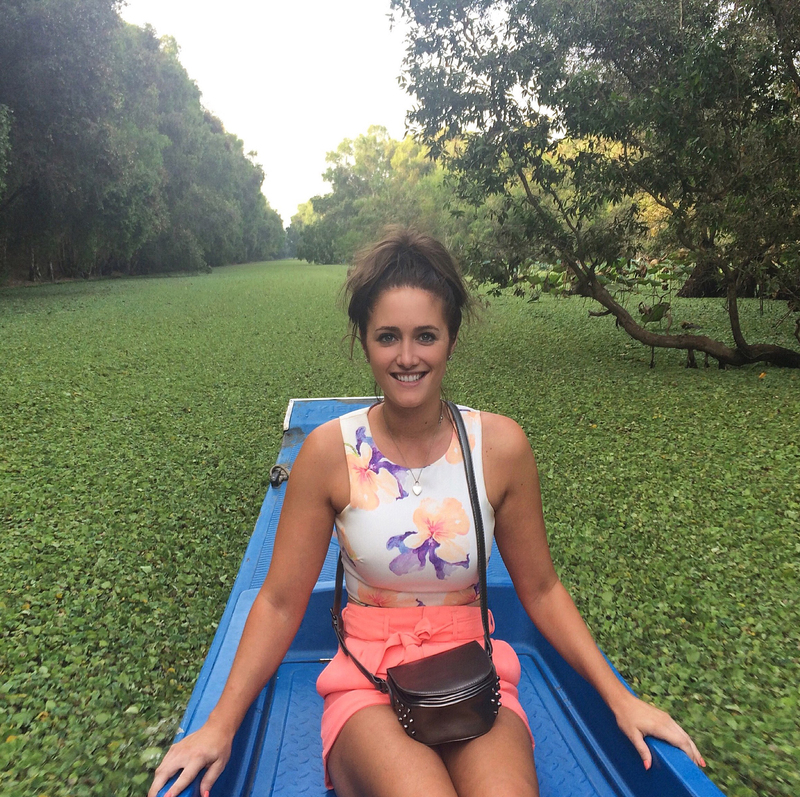 We took a 3 day tour to the Cambodian border and it was by far the best $100 I have ever spent. We got to know the lush scenery of rural Vietnam while visiting idyllic fishing villages and fruit plantations. There was so much to see, we were constantly swishing our heads left to right in order not to miss anything! Then floated down the river on a traditional sampan and through natural canals lined with coconut trees before visiting a bustling floating market. We stopped for lunch on Tortoise Island, amid an orchard garden, made and packaged coconut candy and watched a folk show. Enjoyed the best Pho of our lives from a truck stop (no I’m not kidding! ), before exploring Can Tho’s night markets and TET celebration (Vietnamese New Year). Can Tho is considered the epicentre of the Mekong Delta. It is the largest city in the region and felt like metropolis after our day of exploration! The next day we explored the floating markets of Cai Rang and saw how rice paper and rice noodles are made. 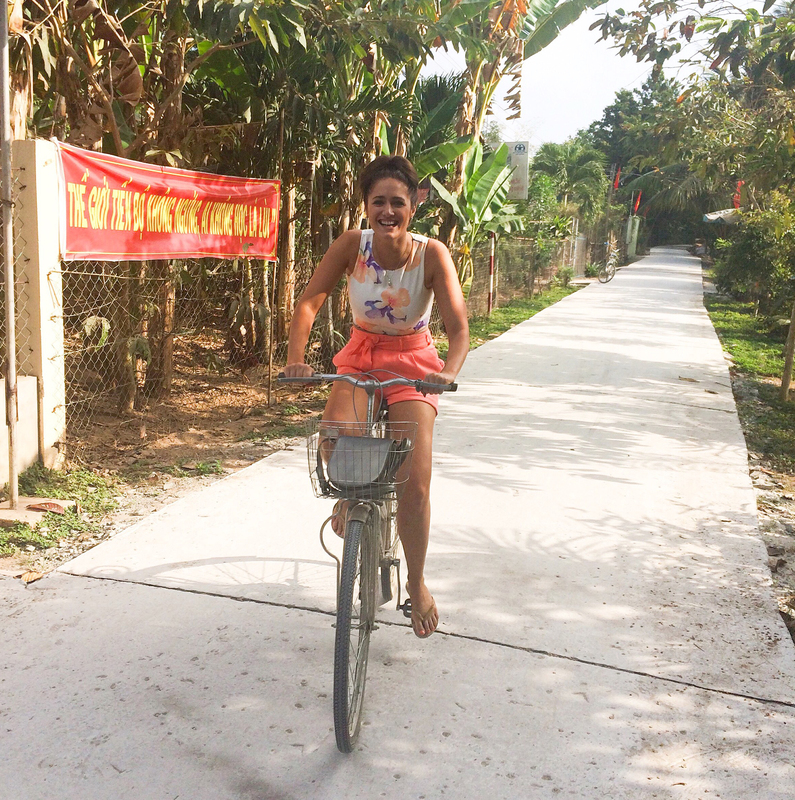 Went for a bicycle ride through Vietnam’s stunning countryside. I could not stop laughing! The bicycles were huge and there were so many tiny dirt tracks and locals to avoid. Watched a cockfight… do not recommend. And I didn’t dare cross the monkey bridge built of only one single stem of bamboo! After lunch we headed to the outskirts of Chau Doc to explore the Tra Su Sanctuary. Took a short walk along paths lined by tall paperbark looking trees to a row of small canoes which lined the waters edge. It was so peaceful, with only the swish of the paddles to disturb the quiet we glided through the mangroves on our canoes. An 850 hectare sanctuary, home to 70 species of birds, 25 species of reptiles, 23 kinds of fish and 11 types of animals, makes Tra Su truly picturesque. 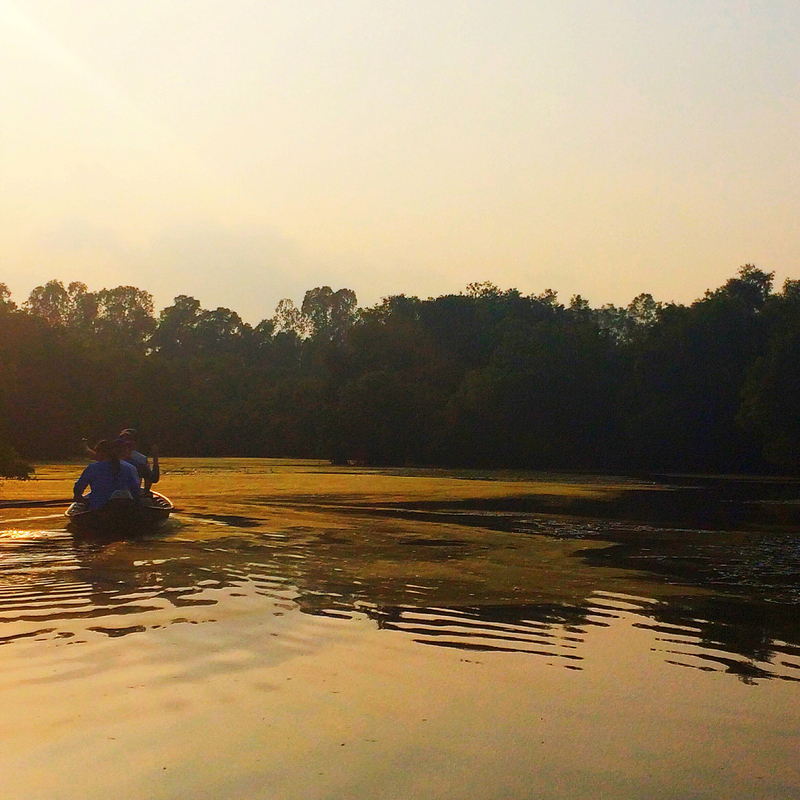 Waterlillies bloom vividly around us as the sun slowly set, making today one of the most magical days of our trip. That night we stayed in Chau Doc and met a gorgeous Vietnamese girl (now also living in Brisbane), Kathy, who took us out to dinner with her family for a traditional meal in the town’s centre. Now that was a delicious feast! 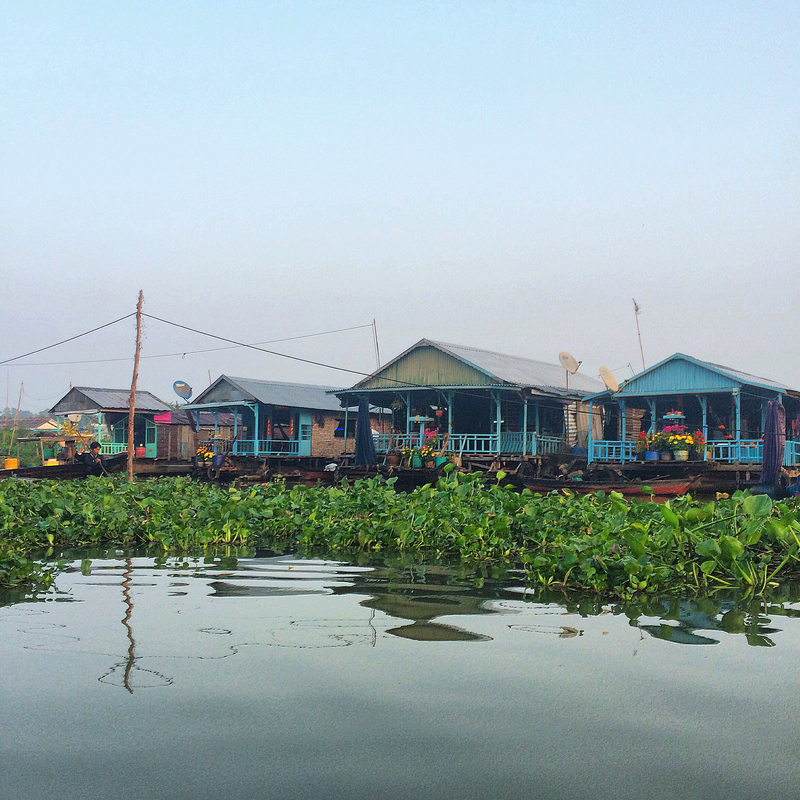 On our last day we took another boat to the famous floating village and visited their fish farms. They have cages that span the entire length of their house that hold fish that they grow, eat and sell. Before taking a fast boast to the Cambodian border, we stopped in at a Muslim village where I kicked a soccer ball around with the children, bought some bangles (which later drove my fellow travellers crazy) and a silk scarf. 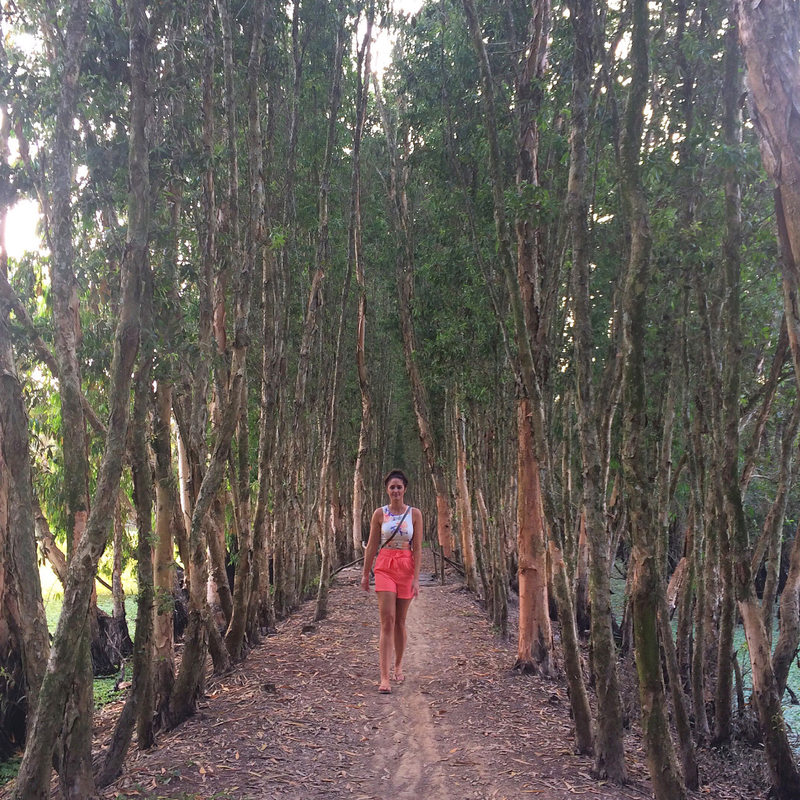 I wasn’t ready to leave beautiful Vietnam! ~ This is Part Two of my Vietnam Diaries Series. I also had to force myself to leave Vietnam when i visited that beautiful country. Vietnam is 1 of the best places that i have ever visited. I also loved Can Tho when i got there. Yeah it’s truly so lovely! I wish I was heading back right now! Thank you 🙂 Glad you had such a great time! Yes it was so amazing wasn’t it! I really thought it was spectacular! Thanks Bill. 🙂 It’s always great to learn a different cultures tradition or way of doing things! It truly was amazing wasn’t it! Thanks James! Haha yes Anjelina. Iv’e always been spec sporty. We call what’s pictured soccer in Australia which I even have a trophy for 😛 But i can kick a footy too haha!